Food drives: Charities need your money, not your random old food. Why food drives are a terrible idea. 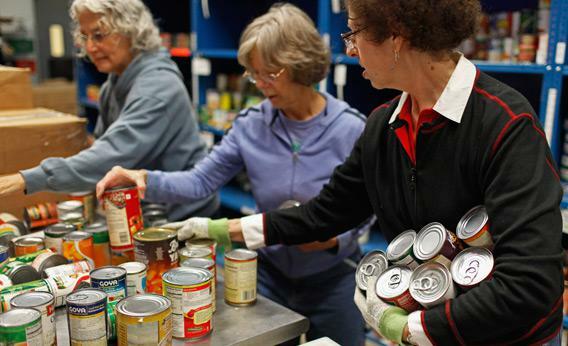 Volunteers in Gaithersburg, Md., sort canned food. ‘Tis the season for food drives. It’s a holiday tradition as storied as Christmas trees, awkward conversations with the in-laws, and embarrassing drunken moments at the office holiday party. Your employer, your church, and your kids’ school put out the boxes and ask everyone to drop off excess canned goods for the needy. Then the boxes are collected, sorted, and handed out to the poor. Everyone feels better about themselves, the hungry get fed, and you get to free up some much needed shelf space. It’s win-win-win. The problem is that, economically speaking, it’s totally insane. America, after all, is not a country stricken with famine. There’s no objective shortage of food, in other words, that makes it vitally important for you to draw down the stockpile in your kitchen cabinet. Indeed, many of us don’t even have that much food socked away, which leads to us going out to buy extra food in order to give it away. But having 100 different people go out and pay retail prices for a few cans of green beans is extraordinarily inefficient relative to pooling those funds to buy the beans in bulk. But it’s even worse than that. All across America, charitable organizations and the food industry have set up mechanisms through which emergency food providers can get their hands on surplus food for a nominal handling charge. Katherina Rosqueta, executive director of the Center for High Impact Philanthropy at the University of Pennsylvania, explains that food providers can get what they need for “pennies on the dollar.” She estimates that they pay about 10 cents a pound for food that would cost you $2 per pound retail. You’d be doing dramatically more good, in basic dollars and cents terms, by eating that tuna yourself and forking over a check for half the price of a single can of Chicken of the Sea. Beyond the economies of scale are the overhead costs. Charities are naturally reluctant to turn down donations for fear of alienating supporters or demoralizing well-wishers, but the reality is that dealing with sporadic surges of cans is a logistical headache. A nationwide network of food banks called Feeding America gingerly notes on its website that “a hastily organized local food drive can actually put more strain on your local food bank than you imagine.” Food dropped off by well-meaning citizens needs to be carefully inspected and sorted. A personal check, by contrast, can be used to order what’s needed without placing extra burdens on the staff. A lot of waste also occurs on the other side of the food-donation equation. Rosqueta observes that a surprisingly large proportion of food—as much as 50 percent—provided to needy families in basic boxes winds up going uneaten. When you go to the grocery store, after all, you don’t come home with a random assortment of stuff. You buy food that you like, that you know how to prepare, and that your family is willing to eat. A donation box with high-sodium soups could end up going to people with high blood pressure, and nuts could end up being donated to families with allergic kids. Social service providers know their clients better and, with cash in hand, can pull together items people are likely to want and let them pick what they need, cutting down on waste. These concerns have long bubbled beneath the surface of the food-assistance community, but some organizations are being emboldened to speak out thanks to nutritional concerns. Bloom explains that they tried providing a specific list of items for people to donate, but even so “we find that almost half of what comes to us in any given food drive just doesn’t meet our nutritional standards.” Under the circumstances, telling people that money is more helpful started looking like a more appealing option. Today, a large share of the remaining canned food donations that Bread for the City receives comes from federal government offices where, somewhat perversely, employees aren’t allowed to stage cash drives (though giving through the Combined Federal Campaign is an option). In-kind donations still help, of course, and nobody’s turning away boxes of food. But a fundamental issue is that many organizations feel that asking for money—like requesting cash as a gift—seems somewhat gauche. So, let me be rude on their behalf: Find well-managed charities in your community and trust them to know how to do their job. They have access to food at a fraction of the price. They know their clients, and they have better things to do than to sort through your canned goods. And from your perspective, it’s much easier to document a monetary donation for tax purposes. Good intentions are lovely, but particularly in hard times it’s more important to make sure your charitable dollars go as far as possible. Can the cans. Hand over some cash.